Benign Essential Blepharospasm (BEB) is a disabling focal dystonia marked by involuntary blinking or sustained eyelid closure. It may be caused by spasms of the orbicularis oculi muscle or failure of the superior levator palpebrae muscle to contract. Blepharospasm has a substantial impact on quality of life and may lead to depression and anxiety. No medical or surgical treatments for blepharospasm were effective before the introduction of botulinum neurotoxin A (BoNT-A). Currently, two BoNT-A formulations are approved by the FDA for the management of BEB, and BoNT-A is considered standard of care. BoNT-A provides high response rates and improves patient quality of life with minor adverse events, including ptosis, epiphora, keratitis, dry eyes, and diplopia. Other BoNT formulations are being studied as well. Strabismus, misalignment of the eyes, is a disabling condition that frequently affects pediatric populations but can also affect adults. With a range of presentations, the treatments for strabismus vary and include corrective lenses, eye exercises, occlusive therapy, and surgery. BoNT-A is frequently used as an adjunct and alternative to strabismus surgery. BoNT-A therapy improves vision in more than 50% of patients for 6 months or longer after injection. Optimal strategies for dosing and injecting BoNT are discussed. This activity is directed to neurologists, ophthalmologists, oculoplastic surgeons, family practitioners, pediatricians, and other healthcare providers involved in the treatment of benign essential blepharospasm and/or strabismus using neurotoxin therapy. Beth Israel Medical Center & St. Luke’s and Roosevelt Hospitals designate this online educational activity for a maximum of 1.0 AMA PRA Category 1 Credit(s)™. Physicians should only claim credit commensurate with the extent of their participation in the activity. November 2010 through November 2012. Original Release Date November 2010. Consultant: Allergan, Inc., Lundbeck, Inc.
BEB may be caused by spasms of the orbicularis oculi muscle or failure of the superior levator palpebrae muscle to contract (apraxia of eyelid opening). From a pathophysiologic perspective, patients with BEB have a higher baseline blink rate than control patients. Interestingly, when patients with BEB are engaged in conversation, their blink rates drop off, suggesting that conversation may reduce the excitability of eyelid closure. Beyond the motor disorder, patients with BEB also have a temporal discrimination deficit possibly owing to a loss of short latency inhibition mechanism. Figure 1. 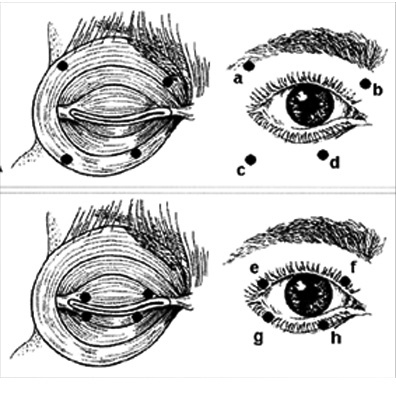 Muscles around the eye are in three sections: a, b, c, and d are orbital muscle; e and f are preseptal muscle, and g and h are pretarsal muscle. Dose escalation may be required in some patients to maintain a therapeutic benefit. A recent long-term (10 years) study used the botulinum neurotoxin escalation index in Units (BEI-U) and botulinum neurotoxin escalation index percentage (BEI-%) among patients with blepharospasm, hemifacial spasm, and entropion. The results showed increases in mean dosages for BEB patients with no change in duration of relief, as well as mean increases in both dosage and duration of effect in BEB patients =65 years of age. This suggests early underdosing for older BEB patients.17 The Prescribing Information for onabotulinumtoxinA suggests that the dose may be increased up to twofold if the response from initial treatment is considered insufficient (an effect not lasting longer than 2 months). Select studies comparing these other botulinum neurotoxins with onabotulinumtoxinA are discussed in Table 1. In general, these various formulations show good efficacy and safety in the management of blepharospasm, and may provide additional options for patients with blepharospasm. In evaluating the comparative data or trying these alternative formulations clinically, practitioners must recognize that there is no dose equivalency among the BoNT products.28 Studies have demonstrated no reliable dose-equivalency ratios; the FDA emphasized in a recent labeling change/ box warning that different BoNT formulations are not interchangeable and should be treated as different drugs.29 Further study is needed to determine the potential place and optimal dosing of these therapies for blepharospasm. Xeomin® (incobotulinumtoxinA) for injection [package insert]. Greensboro, NC: Merz Pharmaceuticals; 2010. Different forms of strabismus vary in their presentation and course. For example, concomitant childhood strabismus typically occurs in children less than 5 months of age and is frequently characterized by a large angle deviation and less-dense amblyopia. Acquired esotropia typically has a later onset—between 1.5 and 4 years of age. This condition can be either accommodative or nonaccomodative. Because of the range of conditions and timing, it is important to reemphasize the eye exam as part of all well-child checkups. Use of BoNT-A therapy for strabismus in children has not been approved by the FDA.6 In children, BoNT-A has been used to treat esotropia. As an alternative to incisional surgery for the treatment of infantile esotropia, multiple injections of BoNT achieve a correction rate greater than 70%.13 The treatment program comprises simultaneous bimedial injection of 1.25 -2.5 U of toxin per rectus muscle. These are to be injected as early as 3 months of age, with repeated simultaneous injections with recurrence of esotropia exceeding 15 prism diopters, increasing the dose to 3 U per eye unless ptosis becomes limiting. Transient partial ptosis, typically lasting 2 to 4 weeks, occurs in about 25% of children after BoNT injection because of proximity to the levator muscle.14 The long-term effectiveness of BoNT treatment was demonstrated in a prospective study of 68 children with acquired esotropia.15At an average of 4.8 years after the last injection, motor success (distance deviation of no more than 8 prism diopters) was obtained in 53%, 71%, and 88% of children who received 1, 2, and 3 injections, respectively.15 The role of BoNT therapy in other childhood strabismic indications (exotropia, sixth nerve palsy, cerebral palsy) requires further investigation. Engle EC. Genetic basis of congenital strabismus. Arch Ophthalmol. Feb 2007;125(2):189-195. Mills MD, Coats DK, Donahue SP, Wheeler DT. Strabismus surgery for adults: a report by the American Academy of Ophthalmology. Ophthalmology. Jun 2004;111(6):1255-1262. Ticho BH. Strabismus. Pediatr Clin North Am. Feb 2003;50(1):173-188. BOTOX [prescribing information]. Irvine, California: Allergan, Inc., August 2009. Carruthers J, Carruthers A. Botox: beyond wrinkles. Clin Dermatol. Jan-Feb 2004;22(1):89-93. Rowe FJ, Noonan CP. Botulinum toxin for the treatment of strabismus. Cochrane Database Syst Rev. 2009(2):CD006499. Moguel-Ancheita S, Dixon-Olvera S, Martinez-Oropeza S, Orozco-Gomez LP. [Botulinum toxin as a treatment for strabismus in systemic diseases]. Arch Soc Esp Oftalmol. Jan 2003;78(1):9-14. Kowal L, Wong E, Yahalom C. Botulinum toxin in the treatment of strabismus. A review of its use and effects. Disabil Rehabil. Dec 15 2007;29(23):1823-1831. Denniston A, Reuser T. The use of botulinum toxin in ophthalmology. Hosp Med. Aug 2001;62(8):477-479. Huber A. Botulinum toxin and the eye. Curr Probl Dermatol. 2002;30:227-235. Tengtrisorn S, Treyapun N, Tantisarasart T. Botulinum A toxin therapy on esotropia in children. J Med Assoc Thai. Nov 2002;85(11):1189-1197. Scott A, ed. The role of botulinum toxin type A in the management of strabismus. Philadelphia, PA: Lippincott Williams & Wilkins; 2002. Brin M, Jankovic J, Hallett M, eds. Scientific and Therapeutic Aspects of Botulinum Toxin. Tejedor J, Rodriguez JM. Long-term outcome and predictor variables in the treatment of acquired esotropia with botulinum toxin. Invest Ophthalmol Vis Sci. Oct 2001;42(11):2542-2546.